White, flaky Tilapia fillets in crispy Italian breadcrumbs. Bring the flavors of the Old World to your next meal with our Tuscan Garlic & Herb Tilapia. 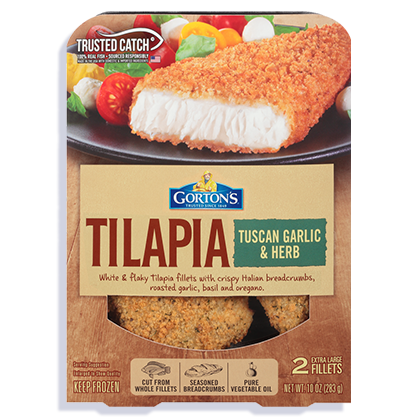 The extra-large fillets are seasoned with roasted garlic, basil and oregano, and coated with crispy Italian breadcrumbs. Bellissimo! 3. Bake and flip after 18 minutes. Bake for 23-25 minutes*. INGREDIENTS: Tilapia fillets, breadcrumb coating, canola oil. Tilapia, sodium tripolyphosphate (to retain fish moisture). Wheat flour, water, yellow corn flour, garlic powder, onion powder, sugar, salt, cultured buttermilk, whey, baking powder (baking soda, sodium aluminum phosphate), spices, maltodextrin, yeast, parmesan and romano cheese (milk, cheese culture, salt, enzymes), natural flavor, parsley, dehydrated roasted garlic, vinegar, tomato powder, citric acid.